Recently, I teamed up with my fried Sus, from Rough Measures to collaborate on a wintery themed post. We both love cooking and sharing recipes on our blogs, so thought it would be the perfect opportunity to collaborate with each other, and produce a themed recipe each! Sus has such a beautiful blog, and I’m so happy to be working with her on this! As we both live in the UK, the weather at this time of year can be pretty dark and cold. So, because of this, we decided to each create a recipe that was really warming and comforting. I couldn’t wait to start cooking! Whenever I think of comforting foods, I instantly picture hearty dishes with ingredients like pumpkin, sweet potato and squash. The flavour, texture and use of these vegetables just somehow instantly manages to fill me with comfort. They have to be three of my favourite vegetables, and when it’s cold outside or I’m feeling under the weather, I love to add them into my meals. Usually, I’ll add them into a stew, casserole or soup – just anything that will fill me up! As I love these three ingredients so much, I knew I had to use one of them in this recipe. After some deliberation, I chose to use the butternut squash – as I knew it would suit the recipe I wanted to make perfectly. What I really wanted to create, was an alternative recipe to ‘oven fries’. 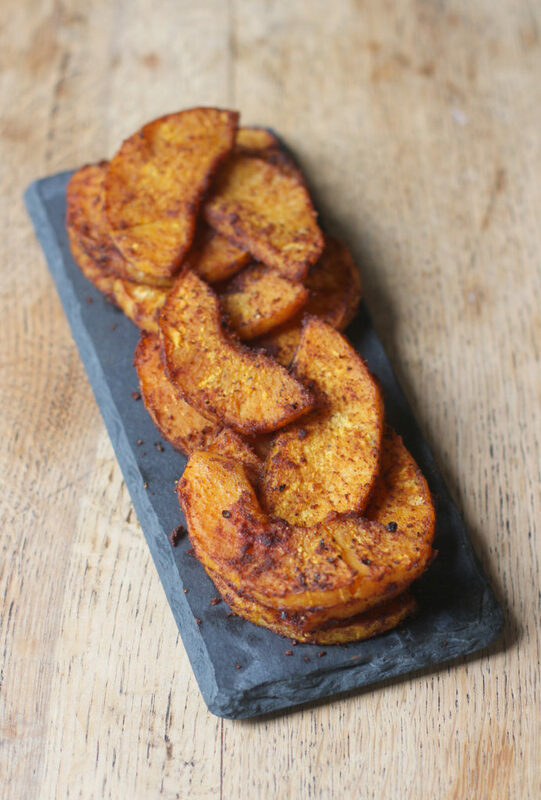 And as squash has such a great, fluffy texture that’s not too different to potatoes, I couldn’t wait to use it to make these. 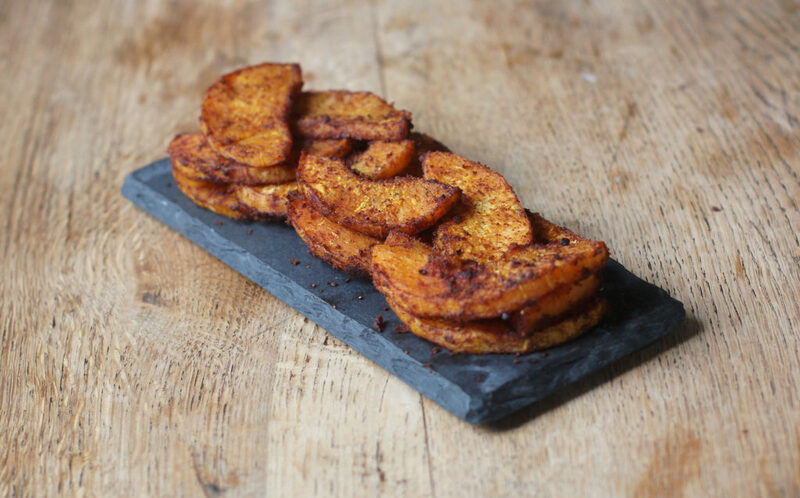 Instead of the standard fry shape, I chopped the squash into chunky wedges – somehow, I find the chunkier shape more comforting! Then, I coated the squash in some olive oil, warming spices, salt and pepper, to give them a big boost of flavour, before adding them in the oven. After baking the wedges for 45 or so minutes, the wedges were then ready to snack on or serve with a main meal. I actually really like using these as a pizza topping! The recipe is so simple and easy to make, so they’re perfect for when you’re craving a really comforting snack that’s also healthy. Don’t forget to check out the delicious treat that Sus’ made on her blog for our collaboration! Her Pumpkin Swirls with Maple Tahini Drizzle recipe looks delicious, and is such a great way to use pumpkin! I hope you enjoy our recipes! Add the butternut squash wedges into a large mixing bowl, and cover with the olive oil, paprika, cinnamon, mixed spice, garlic, salt and some cayenne pepper. Then, using a wooden spoon or spatula, mix everything together until the wedges are evenly covered in spice. When this is done, remove the wedges from the bowl and place them onto a non-stick baking tray, and sprinkle with some freshly ground black pepper on top. Next, move the wedges into the oven and bake for about 45-50 minutes until they are lightly crisp on the outside, and soft on the inside. When they have finished cooking, remove them from the oven and serve. Thank you so much! I love sweet potato fries too! Aww thank you so much Farrah! Everyone has been posting these delicious recipes, and I always read them before I have had breakfast. Now, I’m sitting here trying not to over cook and prepare eight recipes at once! These look incredible, and this will be added to my list of things to make in the upcoming weeks! Commenting via HCBN from blissfullybrunette.com! I don’t have anything wrong with butternut squash in soups or salads or stuffed, but this is by far the most delicious looking way to eat it I’ve seen all season!!! Not to mention the easiest! And the spices you used are some of my favorites too 🙂 Love this recipe! I also love the chunkier shapes! LOVE the cinnamon and paprika here!!! these wedges look so good and perfect for fall! Mmm yum! I love how versatile squash is.. you can literally put anything on it and it’s delish!! 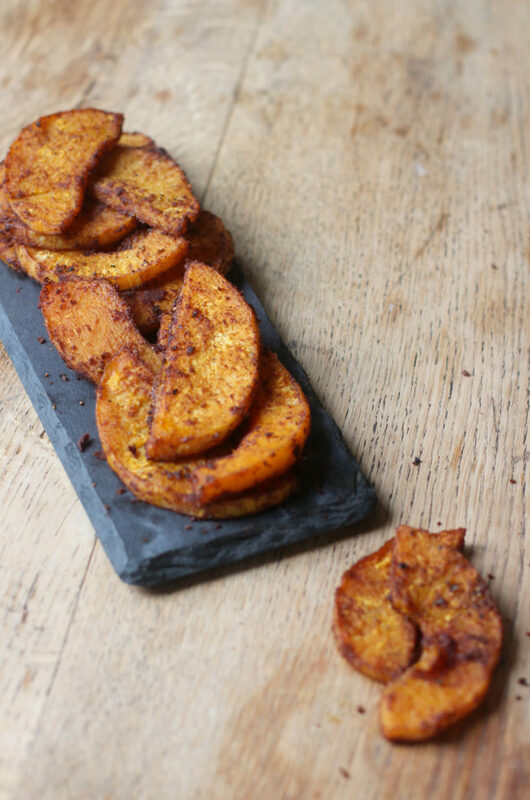 Oooh love the contrast of cayenne and cinnamon on these butternut squash wedges! So lovely, Harriet! A cinnamon paprika girl just like me 🙂 Really that is my favorite and go-to way for cutting and roasting any type of squash! CANNOT for the life of me… WAIT… Until I make these for Thanksgiving!!!!! These wedges look perfect for the season! YUM! I love butternut squash prepared at any way…even just simply cooked in water. These wedges must be very delicious with all the spices. I love how you made this squash, Harriet! it seems perfect cut into these wedges. And the spices sound amazing! Such a wonderful fall veggie! 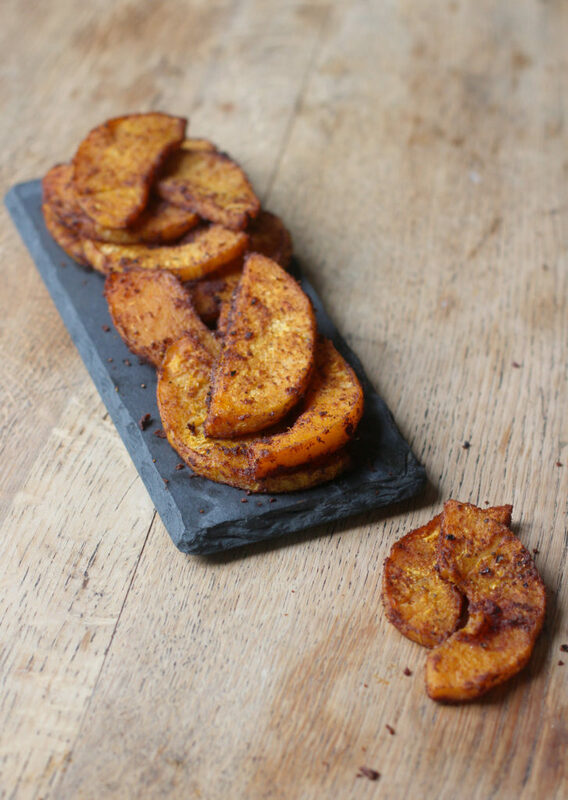 I can’t get enough of butternut squash these days and loved that you made them into chunkier wedges! They look delicious and the cinnamon and paprika sound amazing! Me too! Thank you Kelly! Mmmmm., I am drooling over these deliciously spicy wedges, Harriet. Love how easy and healthy they are. I am sitting here with my mouth open thinking, why in the heck hadn’t I thought of this lol. This is such a fun way to eat squash and you can do so as a snack. I am so loving this girl. I am totally with you – butternut squash = comfort food. I like this new take on them too, seems like the perfect snack! I can’t even tell you how much I love butternut squash!! And with all these warm spices?? This sounds just amazing! These look SO GOOD! I totally love butternut squash and I am always looking for new ways to cook it! I would like to point out my appreciation for your kind-heartedness supporting those people that should have assistance with the concern. Your personal commitment to getting the message across ended up being especially useful and have really enabled others much like me to realize their goals. Your amazing important information signifies this much to me and extremely more to my peers. With thanks; from each one of us.